I’ve always enjoyed being in the spotlight. When I was younger I danced on stage and I also acted in theatre throughout my school years. I’ve just always known I wanted to entertain. 2. What is your favorite part of Acting? My favorite part of acting is connecting with people. 3. Are there any actresses that you would say inspired your style of acting? I was very inspired by Lucille Ball when I was a child but I’ve sort of gravitated towards more dramatic roles, so I would have to say Jessica Chastain. I’m in awe when it comes to her, I think she is absolutely phenomenal and any chance I get to watch something she’s in, I do. I would love to work with her some day, she has taught me a lot. 4. Could you tell us a bit about “Split Cost”? What’s the general plot and idea behind the film? 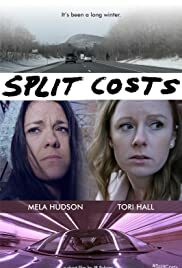 Split Costs is about two young women from disparate backgrounds share a ride to western Massachusetts where traumatic setbacks for each to make pivotal decisions at an unforseen crossroads. The story is very powerful in that it illustrates the beauty of two strangers who find each other during the most tragic moments of their lives. 5. Could you tell us a bit about your character in “Split Cost”? What would you say is her most defining aspect is? 6. What would you say is the most unique aspect of “Split Cost”? What has the general reaction to your “Split Cost” been like? The most unique aspect of Split Costs is that we had an all female cast, and we shot the “dead of winter” film during the warmest winter ever recorded in the northeast. 7. What has the general reaction to your “Split Cost” been like? The reaction to Split Costs has been overwhelmingly positive. I couldn’t be more happy with the feedback and reviews it’s received. So far we have been the official selection to 27 festivals and have won 14 awards. 8. Since you’ve acted in several films in the past, what would you say is the most important thing to know about acting? I think the most important thing is to believe in the work you’re doing. It’s also a lot of work to be an actor. Nowadays everyone thinks they can be an actor but they’re not willing to put in the work. Whenever I do a film I put countless hours of research towards my character. I really live the creating process, your character comes from somewhere, their life doesn’t just begin where your lines begin. 9. If you could work with any actor or actress, who would you pick? I would love to work with Jessica Chastain, Al Pacino, Leonardo DiCaprio, Tom Hardy, and I’m deeply saddened that I’ll never have the privilege of working with Phillip Seymour Hoffman. He was truly an inspiration, and so passionate about the craft of acting. 10. What qualities do you think make a great film, and could you give us a few examples of films that you would consider great? 11. What advice would you give to any who wants to begin acting? To anyone who is just starting out in acting I suggest you get as much training as possible. It is so important to be constantly learning and working towards perfecting your craft. Take any opportunity you are offered to act in front of someone. Don’t be intimidated by the audition process, it’s part of the journey and helps you grow as an artist. 12. Where can we watch “Split Cost”? Where can we follow you to learn more about “Split Cost” and any other projects that you will be working on in the future?